Whether you are building a new home, or remodeling an existing one, the front door you choose has a significant impact on your project, both during installation and afterwards. As the first thing most people notice, you need to choose a door that not only accents your home, but also relays your unique sense of style, and provides the durability and efficiency you need over long term use. If you don’t believe it’s possible to find a door for your home that can do all that, it’s time to discover the Infinity fiberglass door collection from Doors of Elegance. This line of fiberglass doors provides you with everything you need in a new front door. Each door in this collection provides a uniquely beautiful style that will add to the look of your home, as well as high-quality features that add value and comfort. Whether you are looking for a simple design, or you want something with more elegance, you will find them with our selection of Infinity fiberglass doors. When it comes to choosing your door, there are a few different features that you need to consider. These features will not only add to the look of the front door, they will also make your home more comfortable and minimize maintenance needs. The following are some of the benefits of choosing Infinity doors. Composite Stile and Rails – The material of the rails and stiles, which are the edges of the door, have a considerable impact on the durability and the protection against the elements that your door provides. The composite materials used in this line ensure that the door prevents water from entering your home, and will not rust or rot, which are common with metal and wood materials. The stiles and rails will also provide added protection against break-ins, as they do not splinter. 20-Inch Lockblock – The lockblock, which is where the hardware for the door is installed, is an extended 20 inches. This ensures plenty of space to add the handle hardware that you want, without having to sacrifice for one that will fit in the provided space. Smooth Skins – Our Infinity doors have smooth skins, which means they are ready to paint whatever color you choose. 1-Lite Design – These doors feature a 1-lite glass design, making them easier to clean than those that have multiple panels. These features ensure that the door you choose will provide the durability and energy efficiency that you need and expect for your home. However, there are two other major considerations with the Infinity collection. Fiberglass provides a wealth of benefits when used for your front door. In addition to providing energy efficiency that is six times higher than a wood door, fiberglass provides enhanced durability that will keep your door looking and operating great for many years. The combination of the fiberglass with the composite rails and stiles ensures your new front door is built to last, while still giving you a look and style that adds to the beauty of your home. The Infinity collection also includes doorglass blinds, which are sealed with tempered safety glass. 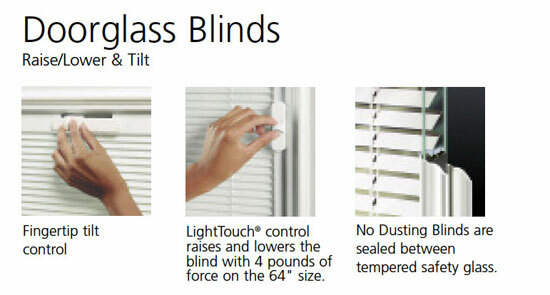 The in-door design means you will never have to go through the hassle of dusting blinds, yet still have the convenience of adjusting the amount of light and visibility into your home. With a LightTouch® fingertip control that provides easy opening and closing, you’ll love the convenience and easy maintenance that these doors provide. If you are looking for a front door that adds beauty, yet also provides enhanced durability, energy efficiency and convenience, the Infinity fiberglass doors from Doors of Elegance are a great option.